My first submission here! Be gentle :P I kid.... I loved this picture of Saber and thought it was nice so I spruced it up a bit and made it all sparkly. It was really the picture that made the wall, but I had fun with it! Not a bad wall. I like the resolution though. Hmm, good for the first submission, guess the whole wall is a bit sharper and needed some improoves, I think it go well with some layers with gaussian blur, and also the blur thing apply for the sparks, well it's just my oppinion. Anyway, good wall from saber... nice pose, colors and effects there. Added to fav! Nice, hmmm ... I think I saw another wall similar to this. Oh well ... Good job .. thx for sharing..
Whoa! The bg looks great...XD Add 2my fav. Arigato! wahhh...cool Saber, nice job...keep it up..
Definitely a thumbs up on it. I like your effects for the background. =P Fabulous. Awesome! nice wallpaper, I like blue color and this sprakkles, I like shining things too ..hehe.. like for a first submission: great job! Wow This a great wallpaper. 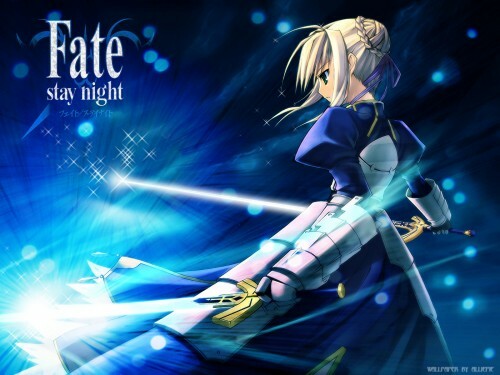 I really love fate/stay night and Saber would be the hottest servant. I like the blue light and the background effects you made. Great job! Really nice wall. I particularly liked the way graceful-looking Saber contrasts well with the blossoms of blue in the background. The glowing effects were well done too. Yup, wowed by yet another Fate/Stay Night-related wallpaper. The lighting effects, in addition to the composition of the wall, are superb -- can't put it any other way really. Excellent stuff.